Finally I have my Ixxi prize from the Yvestown giveaway hung, and I simply cannot rave about this product enough. On first reading about Ixxi I thought it looked fab but I did wonder what the quality of the tiles would be like - when you hear that it's made of card you might wonder if they will live up to the stylish photographs on their website in real life. But the quality is really fantastic, and putting it together each tile was a more gorgeous shade than the last. I know I'll be running down to B&Q with a bundle of them to mix paint from someday! It took quite a while to put together all the (440!) pieces which I did at first think would be a bit of a laborious task, but once I got into the rhythm it was really satisfying snapping them into place, a bit like popping bubble wrap! Despite a few wee hiccups along the way my Ixxi has been an absolute pleasure from start to finish. From the tactile stylish packaging, to watching the image emerge piece by piece, to finally seeing it in all its glory on the wall - I love my Ixxi. 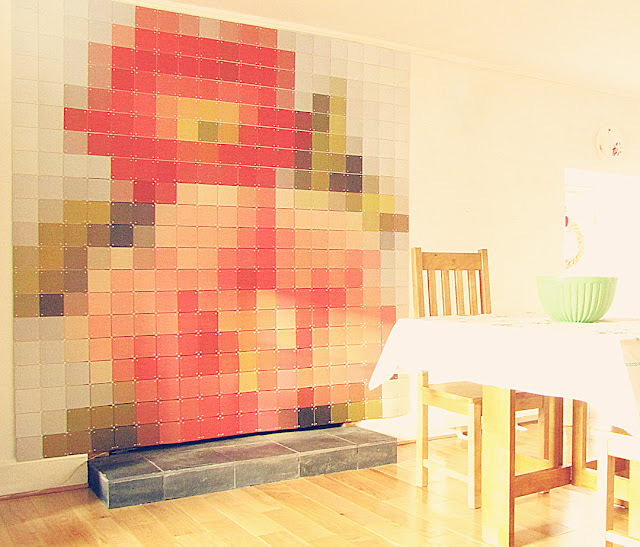 I think the pixelated image works perfectly with the tiles and I really hope to be able to create my own one day too. I feel so lucky to have won this, and I want to say a huge thank you to Yvonne and the Ixxi folks. Thank you :) I was so lucky to win it!